Identify PC motherboard to obtain driver and UEFI/BIOS updates - PC Buyer Beware! To obtain device driver and UEFI/BIOS updates, first step: identify PC motherboard. The make and model of the motherboard installed in a computer is not identified in the Windows Device Manager – in the Control Panel in Windows 7/8.1/10 – and it might also not be possible to identify it by opening the case and examining it, such as, if it is the motherboard of a laptop that is out of sight, buried under components. 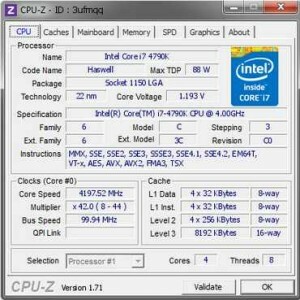 If you need to know the make and model of motherboard in order to download a user manual, driver updates and software patches from its manufacturer’s site, the free CPU-Z from http://www.cpuid.com/ provides a quick way to identify a PC’s processor (CPU), motherboard, and RAM. It provides plenty of information on those components in Windows XP/Vista/Windows 7/8.1/10. Of course, in keeping with its name, it displays all of the information about the processor that you might need to know, such as its make and model, clock speed, FSB and clock multiplier settings, etc. Another useful utility that identifies the software and hardware used by a computer is the free Belarc Advisor from http://www.belarc.com/ under Free Download. If neither of those utilities identify your PC’s motherboard, open the case and look for the manufacturer’s identification – make/model – usually written large on the motherboard itself. The device-driver updates for a motherboard’s components, provided from its manufacturer’s website, include the USB Controller, IDE or SATA drive controller, PCI Express graphics device driver if the graphics are provided by the motherboard instead of a separate graphics card, etc. UEFI/BIOS file updates should also be available, if provided. You need the exact make/model and board revision number in order to obtain the correct UEFI/BIOS update if a live update system is not provided and the BIOS update has to be installed manually by ‘flashing’ it. The manual gives the motherboard’s specifications and illustrates and explains how to install components such as the processor, SATA drives (hard disk/SSD/DVD drives) and the RAM memory. There is a section devoted to the UEFI/BIOS at the end. It should provide information on setting the boot order of devices. If you want to boot a Windows system using a boot disc, the boot order of devices settings in the UEFI/BIOS has to have the CD/DVD drive set as the first boot device. If there is no disc in the drive, the BIOS will boot from the second boot device, which should be the hard disk or SSD drive on which Windows is installed, so there is no need to reset the hard disk or SSD drive as the first boot device, just remove the boot disc after use. November 24, 2015 in Motherboard and Power Supply (PSU) Problems.